Is supra-ventricular arrhythmia a reason for the bad performance of the FlowTrac device? In their recent paper evaluating arterial waveform analysis as a tool to measure cardiac output (CO), Michael Sander and colleagues do not provide data on the heart rhythms of their cardiac surgery patients . As the FloTrac (Flowtrac/Vigileo, Edwards Lifescience, Munich, Germany) device calculates CO from an arterial pressure-based algorithm, integrating vessel compliance and peripheral resistance effects, it seems plausible that these measurements may be influenced by cardiac arrhythmia. We recently treated a septic patient with atrial fibrillation who, in addition to monitoring with the FlowTrac device, received a pulmonary artery catheter because of a suspicion of right ventricular failure. The patient was on pressure-controlled mechanical ventilation. We found no significant correlation between simultaneous measurements performed with the pulmonary artery catheter and measurements performed with the FlowTrac device (r = 0.297, P = 0.405). Bland-Altman analysis showed a mean bias of -0.43 l/min and limits of agreement of -4.5 and 3.6 l/min (Figure 1). This finding is in keeping with the results of a pilot study assessing the FloTrac system, which found worse correlations between waveform-based measurements of CO and thermodilution-derived CO for patients with atrial fibrillation, as compared to patients with sinus rhythm . Measurements of cardiac output performed with the pulmonary artery catheter and with the FlowTrac device. 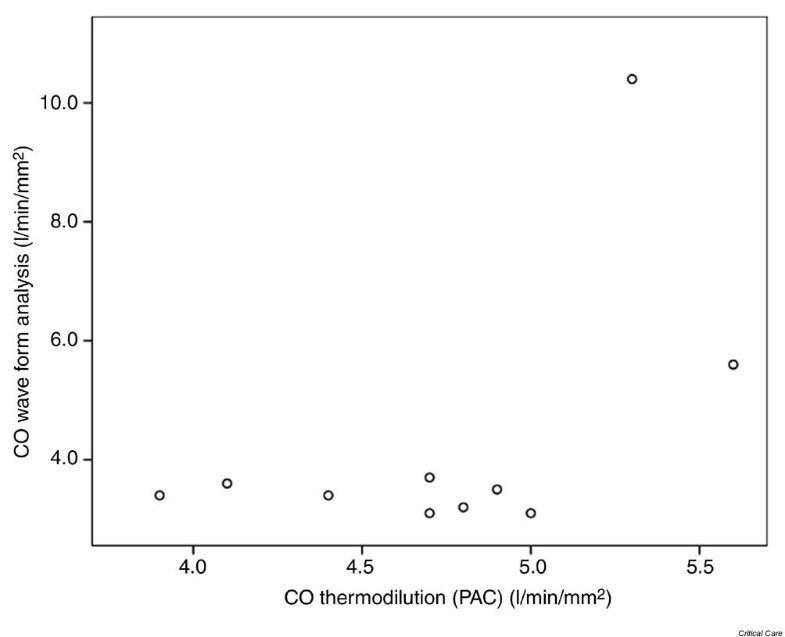 Scatter plot of cardiac output (CO) measurements by FloTrac versus measurements by pulmonary artery catheter (PAC). In Sanders and colleagues' study, sinus rhythm is not mentioned among the prerequisites for measurements to be included in the analysis. We wonder whether the FloTrac device could provide meaningful data in patients with regular rhythms. Given the scarce and unfavourable data on the validity of this system, we believe that it should not be used at present, especially not in a medical intensive care unit setting where supra-ventricular arrhythmia is common. We read with interest that Umgelter and colleagues confirmed our data regarding the validity of the uncalibrated arterial waveform analysis cardiac output (COWave) in a medical intensive care unit patient. In our study we found a good correlation of aortic transpulmonary thermodilution cardiac output (COTranspulm) and pulmonary artery catheter thermodilution cardiac output (COPAC) measurements prior to, during, and after coronary artery bypass graft surgery surgery . We found an overall mean bias and a limit opf agreement (LOA) of -0.1 l/min and from -1.8 to +1.6 l/min, respectively, for COPAC versus COTranspulm. In contrast to this we could not establish that pulse contour analysis with an uncalibrated pulse contour algorithm (COWave) is a method yielding reliable results under difficult conditions in perioperative coronary artery bypass graft patients. COWave underestimated COPAC and showed a wide range of LOAs . In the study we observed a mean bias and a LOA of 0.6 l/min and from -2.2 to +3.4 l/min, respectively, for COPAC versus COWave. We agree with Umgelter and colleagues that the cardiac rhythm might influence the algorithm by which the COWave device calculates the CO. The influence of the heart rhythm on the validity of pulse contour CO devices is unclear, however, as no good controlled studies have so far been published. At least we can state that, in our study, this was not the reason for the underestimation of and the wide range of LOAs, since during the study all patients had sinus rhythm at all measurement points. Even for calibrated pulse contour systems it is not entirely clear when recalibration is necessary [3–6]. Proving the validity of uncalibrated devices is therefore even more important in large controlled clinical trials in patients with different clinical problems such as unstable heart rhythms, changes in systemic vascular resistance, and haemorrhagic shock.